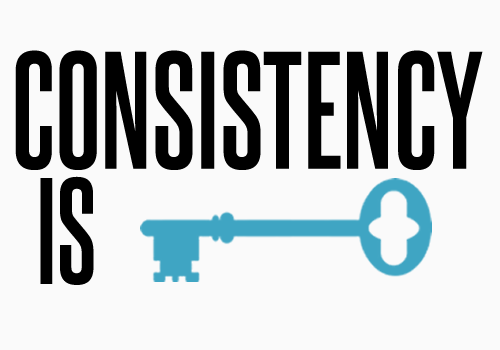 One of the biggest struggles for myself and most people on the journey of success is consistency. I believe the lack of consistency in a person’s life is the root of their conflicts and challenges. A bad marriage is just two people who chose to inconsistently adhere to keeping the habits that caused them to love each other. 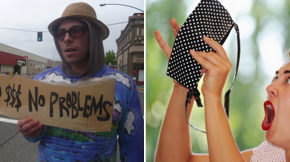 Problems with finances are due to inconsistent saving, budgeting, and investing. Problems in business stem from inconsistently delivering the product or service your customers expect. 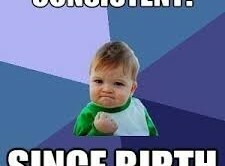 I think I have painted the picture how important consistency is and now I hope to dispel the myth that some people are more consistent than others. Consistency is not something you are born with, it is a learned behavior and anyone who desires to be consistent can learn the art of consistency through habits. Wow the ultimate key to Jerry Seinfield’s major success is consistency. Maybe you don’t want to be a comedian or a writer, but what one thing can you do every single day that will help you be the JerrySeinfield of your field? Your daily habits are predicting the future of what you will eventually become. Self-discipline is what gets a habit formed, and once the habit is formed consistency will continue. I’ve had a long-term problem of waking up later in the morning, for the majority of my life I created the habit of being a “night owl”. Noticed I said I caused my self to be a night owl I wasn’t born a night owl, and thank goodness through proper habits I have joined the early bird club by getting up at 5ameach day. I am still a work in progress and I sometimes slip but I know what causes me to slip. For example if I go to bed after 12am it’s much harder for me to wake up at 5am, but even I go to bed at11:45pm I am able to wake up early. What are your triggers? What actions or things throw you off the course? Another way to measure your inconsistencies is to track how you use your time. For the last 3 weeks I have used a FREE tool that has revolutionized the way I get things done. It’s called Toggl and basically it allows you to track your time and input what you are working on. You just push “start” when you start a project and push “stop” on the timer when its finished. I highly recommend trying it because it can help you point out any inconsistencies that you may not have noticed. Whatever you measure magnifies. If you measure your results you can magnify them, but if your not measuring anything how can you improve? I am not suggesting you plan for failure but I am telling you that there will be times you might “fail” on your road to consistency. What is a contingency plan you may be thinking? It’s simply a plan designed to take a possible future event or circumstance into account before it happens. Airplanes, trains, buses, and most modes of transportations have plans in case something fails. Do you have a first aid kit in your home? You don’t plan to hurt yourself but you are prepared for it just in case you do. How much more important is it to have a contingency plan for your life’s habits. Just in case you fall off the consistency track of working out everyday, writing everyday, shooting hoops everyday, or whatever else you want to be consistent in. For example if I wake up later than 5am my commitment to myself is to avoid doing that 2 days in a row. You can apply this principle to your life,whatever you want to do daily make sure you do not allow that bad pattern to form two days in a row. Hopefully you found this helpful, and if so please comment below on one thing you took from this article.